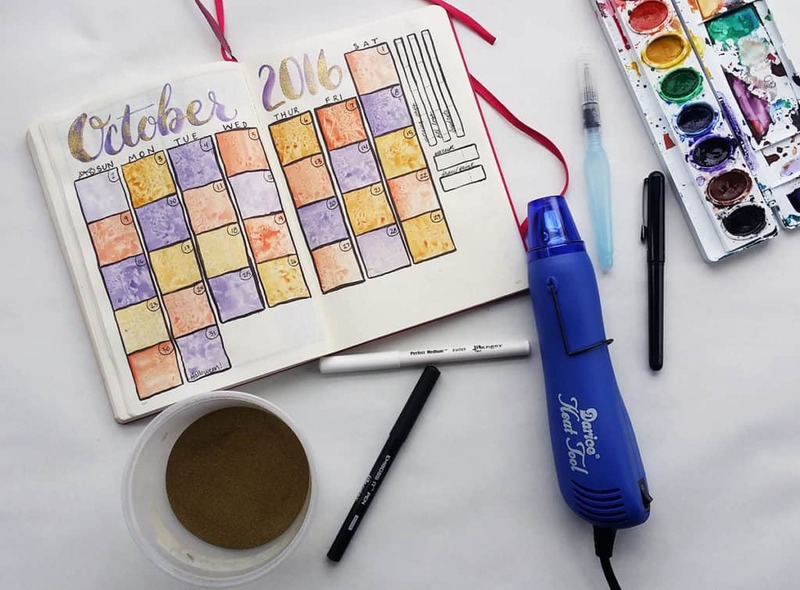 You are here: Home / Bullet Journal / Bullet Journal Monthly Spread – October is Here! 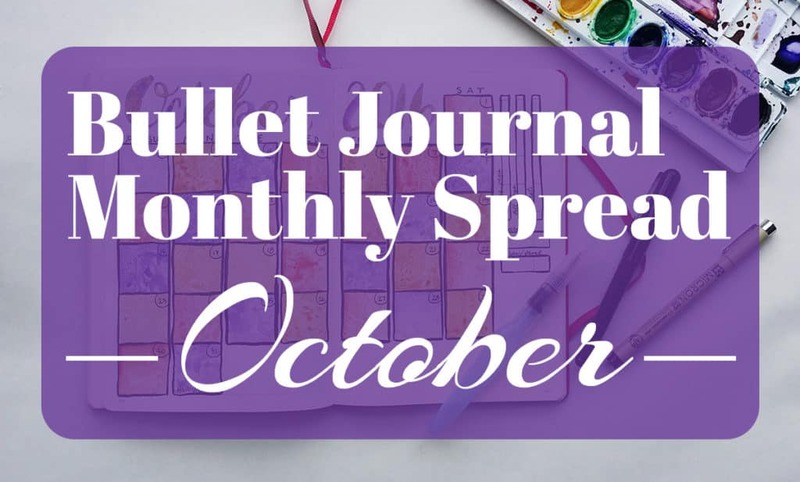 Bullet Journal Monthly Spread – October is Here! Hello my lovelies! It is now officially my favorite month of the year! I have celebrated by decking out my bullet journal monthly spread. If I can’t adequately decorate my apartment for Halloween, then you better believe that my bullet journal is getting extra attention. Let’s dive in! Before I get into October’s spread, let’s close out September, shall we? As you can see, this month was a mixed bag for my goals. I nailed Morning Pages and hit my art goals, so yay! But exercise and hydration weren’t so great. I think I need to refocus my goals and zero in on a better amount of hydration. For exercise, I just need to try harder. If you’re wondering about bullet journaling every day, I just went on vacation and didn’t bring the old Leuchtturm. No need to plan while out camping! Here’s the ol gratitude log from September! Most of it went really smoothly, but there are a few days that never got filled in. I have no idea why, but oh well! I’m not too worried about it. I was doing pretty well this month on filling out my gratitude log and habit tracker on a more regular basis. Overall, it was a win. Here’s my habit tracker for September, along with my memories page. I thought I’d try to just use one pen (or nearly one pen) to write out all my memories instead of doodling them. For the majority of the memories, I used my new favorite brush pen – the Pentel Pocket Brush Pen. For that little piece of blue up near the top, I used a Faber Castell Pitt Artist Pen. And as always, I used my Staedtler Triplus Fineliners to fill out my habit tracker. They never get old! Lastly, I have my blog stats page – or more specifically, my blog goals page. I’m very, very pleased with September’s growth! I’ll go more into it below, but I’m just so happy with hitting almost all my goals for the month. Go Shelby! I actually filmed this whole month’s set up, but sadly, the camera crashed and I lost all the footage. So I’ll just have to tell you how I got that cool texture on my calendar. It’s super crazy complicated (just kidding, it’s wicked easy). First, I used my Pentel Pocket Brush to draw out all the boxes. Then I wet my Prang watercolors and applied my paints using the large Pentel Aquash Water Brush. While the paint was still wet, I pressed the saran wrap into the paint to get that cool stained glass effect. It’s super easy! You may detect that there’s some sort of color distortion on the header. It’s hard to tell in this shot, but there’s a neat little secret baked into “October 2016”. It’s easier to see what’s so special about it by watching the page move. It’s GOLD! I used gold embossing powder on the slightly wet paint (which I brushed on with the Aquash Water Brush) and heated it quickly with a heat gun to make this very cool effect. The powder only stuck to the spots that were still wet, so the gold is only on there in dashes. I could have used an embossing pen, but I wanted to get that natural pattern. Plus, who doesn’t love gold and purple? It’s one of my favorite color combos. I just had to use it for October. 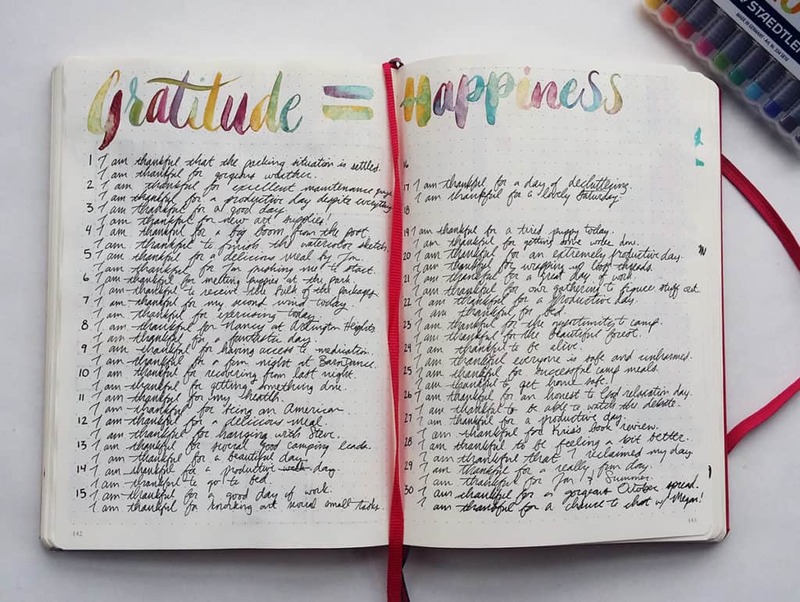 As usual, the next page is my gratitude log. After that is my habit tracker and monthly memory page. For my habit tracker, I changed up a few habits. The perceptive may notice that an old staple is gone! Can you spot it? 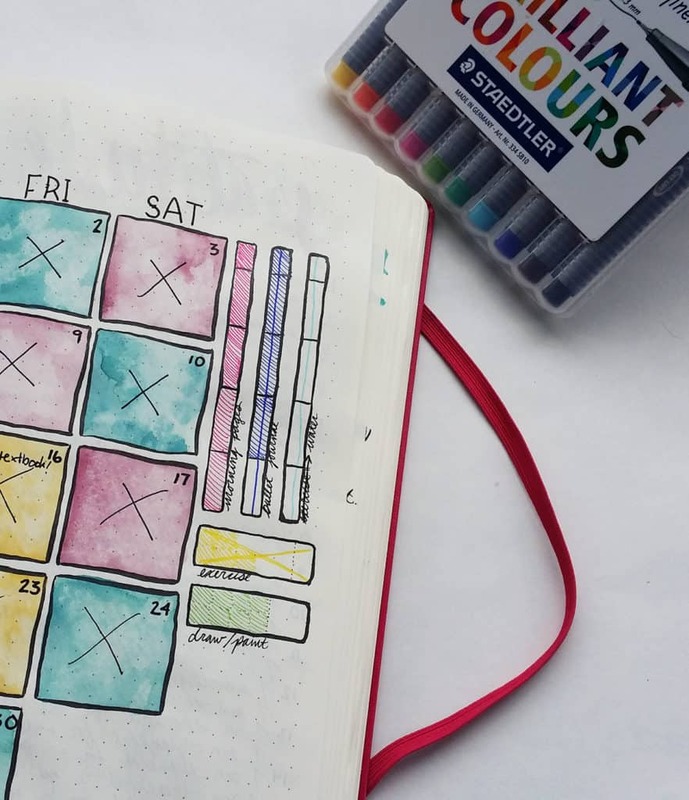 I used to have “bullet journal” as a daily habit to check off, but I don’t think I need those training wheels anymore. That’s an old remnant from the days where I was really trying to get into a planning routine. 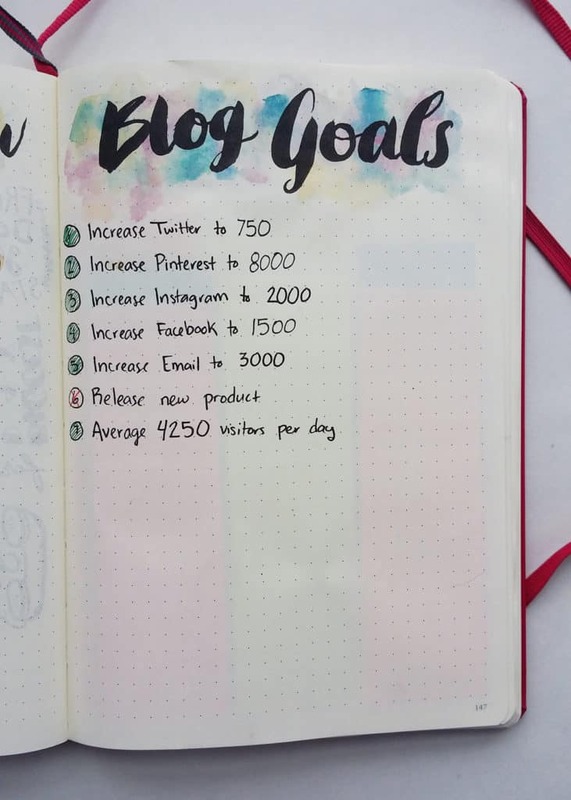 I wasn’t so great at using my bullet journal every single day, but it’s firmly in my routine nowadays. I don’t use it quite every day, but I use it every day I need it. 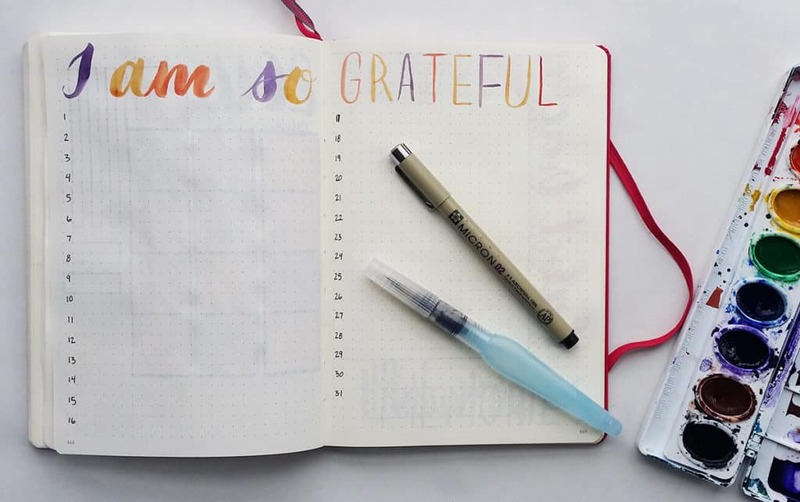 Now, my habit tracker reflects my next big step- filling out my gratitude log and habit tracker every day. I am guilty of forgetting to fill both out for days at a time, meaning my logs are not truly accurate. So I’m trying to focus on that for each day and pound that habit into my schedule for good. After my logs, I have my monthly evaluation of my blog’s progress. It’s been a really exciting month for the blog and I am thrilled to share my numbers with you. The visits and pageviews have jumped up healthily for September, with pageviews getting pretty darn close to the quarter million mark. That’s so crazy! I feel so lucky to have such a wonderful audience of people who are positive and encouraging. I wouldn’t be where I am without you, so thank you so so much. Besides those stunning numbers, my social media has continued to grow and expand. I’m sure a lot of that is thanks to teaming up with John from J*B Welly and Megan from Page Flutter for the giveaway in September. If you haven’t gone to her blog and read her stuff, you definitely should. She’s been so great to work with, and I can’t wait for the next giveaway! I’m not sure when it will be, but it will be fun to do no matter what. 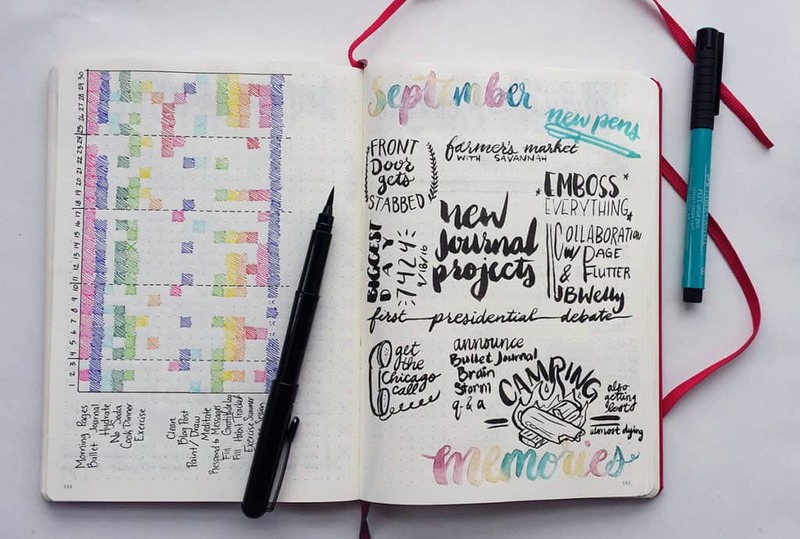 And Megan and I just hosted our first free Bullet Journal Brainstorm Q&A yesterday! It was a blast to do. If you couldn’t catch the live show, you can watch the video right here. Comment on the video or on this post if you liked it and want us to do more! Anyway, I can say that in terms of numbers, the month has been very good to me. As for income, I did take a bit of a downturn. It’s nothing that I’m worried about, because I know exactly what happened. I didn’t put nearly as much energy into my side hustles as the month before. Oops! It’s something I’m going to focus on more in the coming weeks, so hopefully I see an uptick. There’s a lot more motivation to not be lazy when your paycheck is dependent directly on the amount of work you put in. This was just a little reminder to keep on hustling! If you want to check out my top five posts for the month, here they are in order of popularity! 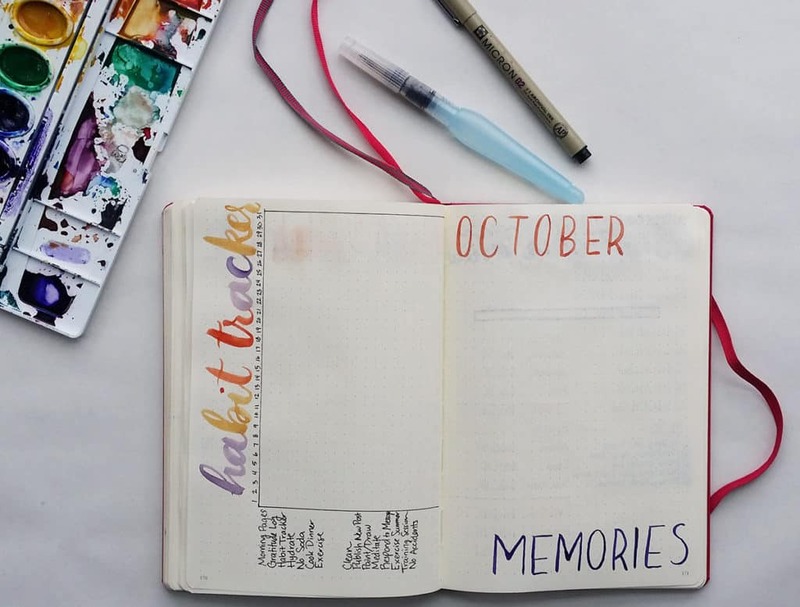 That is it for my October bullet journal monthly spread! It’s by far one of my favorite monthly spreads thus far, right ahead of September. I’m hoping to knock this month out of the park and really make myself proud. 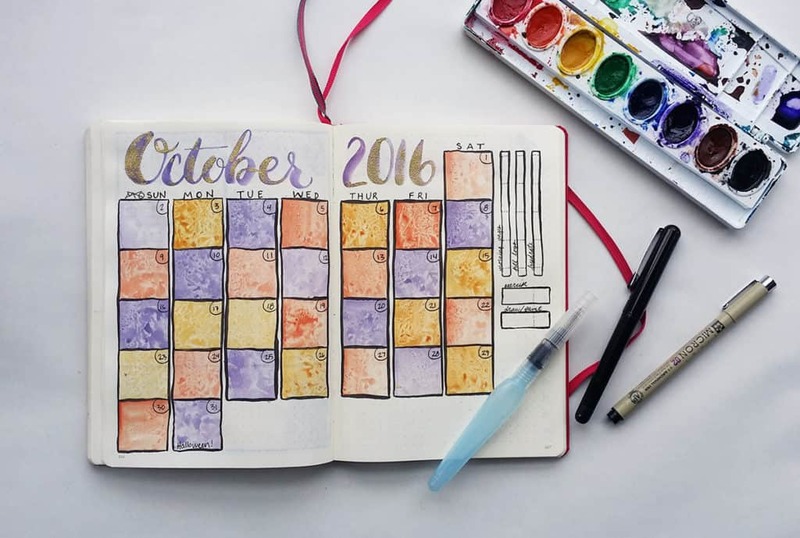 October is one of the best months of the year for me, so I want to make it special. What about you? 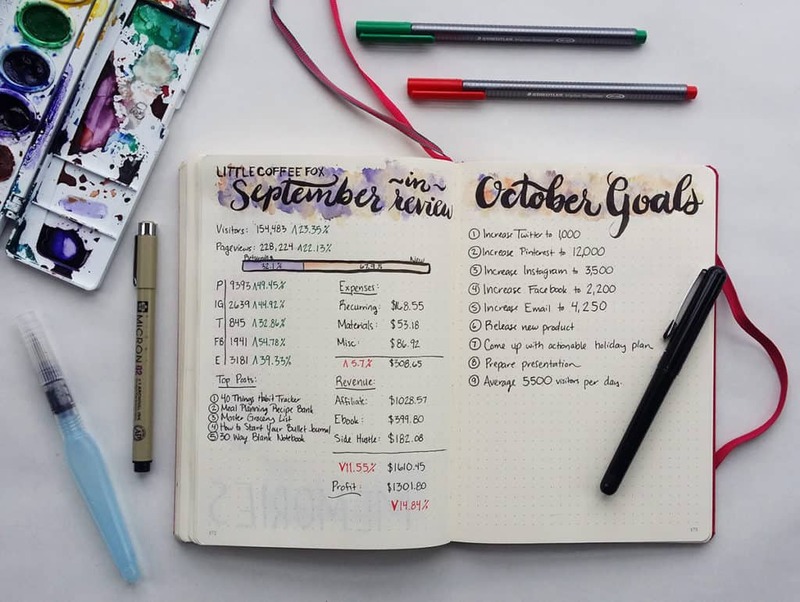 What are your big plans for October? And bonus questions – What are your big plans for Halloween? I have no idea what we’re doing yet, but I can promise you that I will at least be attending some kind of haunted house. I’m just cheesy like that. Also, make sure to follow my Instagram to see my day-to-day spreads and all the ways I’ve been playing with watercolor in my Leuchtturm! I’ve also decided to try and tackle Inktober and really go back to my artistic roots. It’s going to be a fun month over there! I can’t wait to really feel the transition to autumn. This is where it really starts to get into that fast-paced winter/holiday season, so I’m trying to prepare for that madness early this year. I want to be ready when the holidays hit and really get to experience this season like never before. It’s so exciting and I look forward to what new challenges October will bring! P.S. If you want to grab some neat and FREE monthly printables, sign up for the Fox Den Resource Library and grab some today! Hey! This post is amazing and so creative. It’s great!